Even the chicken noodle soup is disguised as a ghost. And, although I couldn’t find 30 bags of Halloween pretzels for the fifth grade party, I did find 30 bags of non-Halloween pretzels. I’m pretty sure they’ll taste the same, and I didn’t have time to hit a fourth store. As I paid for them, I thought of my oldest sister, who once told me that those emails asking people to volunteer are not for me. Sorry, Maureen. I really thought I could pull off sending in Halloween pretzels! Halloween always reminds me how quickly the children are growing, the way holidays do. One of our sons carved his own pumpkin this year, all by himself, and he did an amazing job. 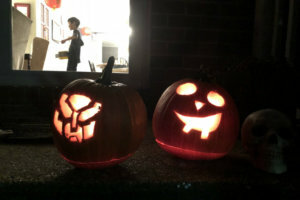 He carved an Autobot symbol on one side and a Decepticon symbol on the other. Again this year, both boys had definite opinions about their costumes. After years of characters and a couple furry animal outfits, this year they are being different versions of the Grim Reaper. One is called “The Phantom of Darkness,” and the other is “The Soul Taker.” They both have scythes, and for weeks we’ve been debating whether it’s pronounced siiiiiiiiithe or sithe. I don’t know, and I refuse to look it up. It’s much more fun to discuss it at length. Somehow the boys are still ridiculously cute even when they’re dressed in all black with creepy disguises. Wait, did I say, “Cute”? I meant “scary.” Really, really scary. At 8 and 10, they’re still trick-or-treating. I know that won’t happen forever. But it’s all right. We have the now. I don’t want to be sad that the present isn’t the past or worried that the present isn’t the future. I just want to enjoy today and tuck a few memories and Kit-Kats away. And I hope you can too. May your soup be scary, may your costumes be perfect, and may your day be sweet.